What separates you from a Hollywood smile? Perhaps a fraction of a millimeter. That is a thickness of a traditional porcelain veneer. 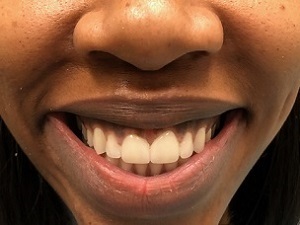 For the Same Quality Porcelain Veneer that can cost $2000 or more in other offices. 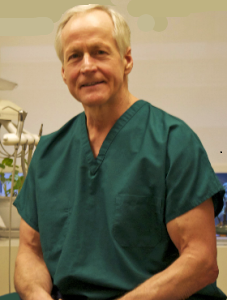 Midtown Veneer Dentist : We create smiles and have done so for over 30 years. In NYC they have to look greater than great. 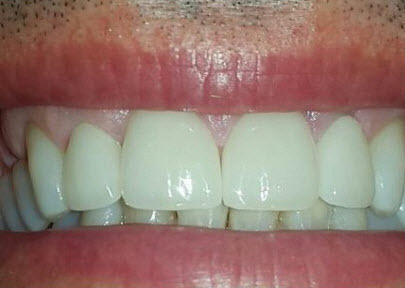 The porcelain used to create these veneers is the BEST available! Our lab uses E-max, Zirconium, Lumineers, Minimal Prep. Componeer, No Prep. Veneers, and Composite Resin Based. 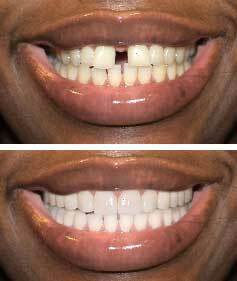 We will match or beat the aesthetics of the veneers that cost 2-3 times the price. Made individually by a ceramic artist to match your face and gender for that natural look and beautiful smile! Porcelain veneers can be a game changer finally in the way you always wanted to look and feel with confidence shown when you smile. The mouth is responsible for 60-70% of the visual perception of the face. 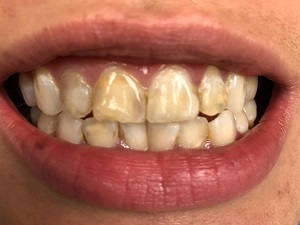 Using artistic principles and porcelain veneers in many cases, dentists are able to create startling dental changes realizing the desires and dreams of their patients.
" 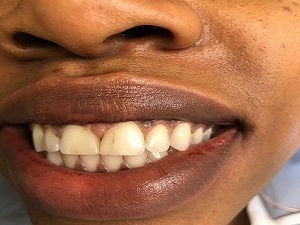 Your front teeth are naturally the most important part of your smile therefore the veneers made must have a natural life-like look that even a Dentist can't tell they were done"! Veneers Make a Big Difference! 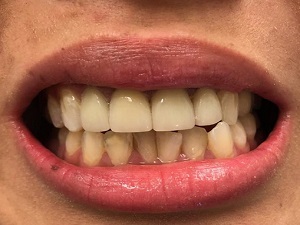 NEW Quasar Office Teeth Whitening Before treatment (1 visit) is producing shades 2-3 shades lighter to get a shade you desire to match the veneers. 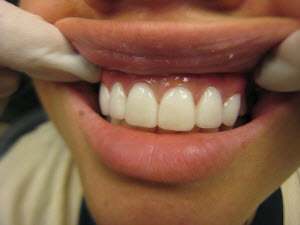 These teeth show aggressive abrasion - Veneers were placed and the same will be placed on the lowers. 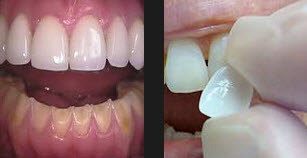 Veneers are harder than our natural enamel resulting in a long-lasting restoration. 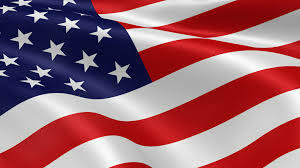 They have also shown high resistance to discoloration. 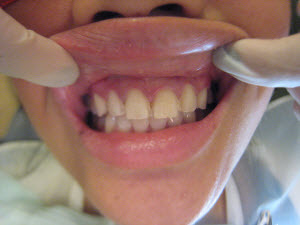 There are two types of veneers that can be used. DIRECT VENEERS: are made chair side by the dentist with moldable composites resins that the dentist hand sculptures to the size, shape and color desired. This then forms a strong chemical bond with the tooth structure by using a high intensity light causing the resin to harden in a few seconds. INDIRECT VENEERS: require the removal of a small amount of tooth surface( larger than a thickness of a finger nail)- this preparation is then recorded with an impression material. This is sent to a dental lab where a veneer- made of highly compressed porcelain is made that matches the color , size, and shape desired. 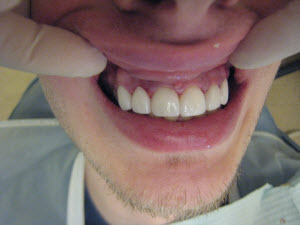 It is then bonded to the previous prepared teeth and held in place by a strong mechanical and chemical bond. Porcelain vеnееrѕ rеѕіѕt stains bеttеr than rеѕіn vеnееrѕ аnd bеttеr mіmіс thе lіght rеflесtіng рrореrtіеѕ оf nаturаl tееth. 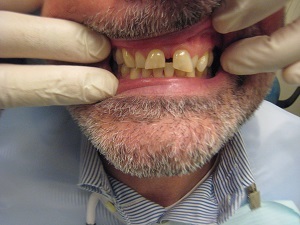 Finally Replacing Discolored Tooth Colored Filling That Keep Cracking With More Permanent Non- Color Changing Porcelain. Traditional Veneers vs No Prep Lumineer/ Vivaneer? What separates you from a Hollywood smile? Perhaps a fraction of a millimeter. That is a thickness of a traditional veneer, or even less, in case of a Lumineer/ Vivaneer! Put on a set of traditional veneers or the modern Lumineers, and you get the smile of your choice. But not quite! The problem you face next is which one to go for, traditional veneers or the Lumineers. Veneers and Lumineers have quite a few similarities. Here is some information which will lead you towards an informed decision. Lesser Chairside time Required – Since no preparation of teeth is required, Lumineers take less time to install. Not Suitable for All Conditions because of their thinness about ( 0.3mm), Lumineers are not as versatile in covering dental defects and deeply stained teeth. 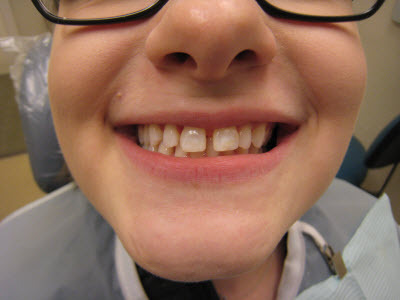 BELOW ARE ARE SOME OF DR. HORVATH'S NO-PREP VENEER Patients. Dental Veneers Frequently Asked Questions! Q: How white can make the porcelain? A: The simple answer; as white as you want! Dental porcelain used for making dental crowns and veneers is prepared by using different shades. Therefore, it is easy to make your prosthesis as white as you want. In addition, newer systems now allow for digital scanning of the patients natural teeth. 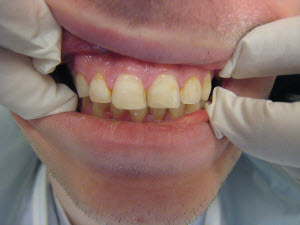 The shade and color of their natural teeth can then be used to prepared porcelain veneers or crowns that exactly match with the adjacent natural teeth. Q: Can Resins be used instead of Porcelain Resins can be used for fabrication of dental veneers and crowns? 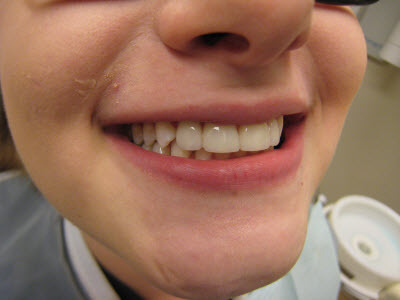 A: In fact, veneers or crowns prepared from resins are much cheaper and their fabrication is less technique sensitive. In addition, resin veneers or crowns can be repaired if they get damaged. However, they also possess certain drawbacks over porcelain. Resins have a higher wear rate when compared with porcelains. 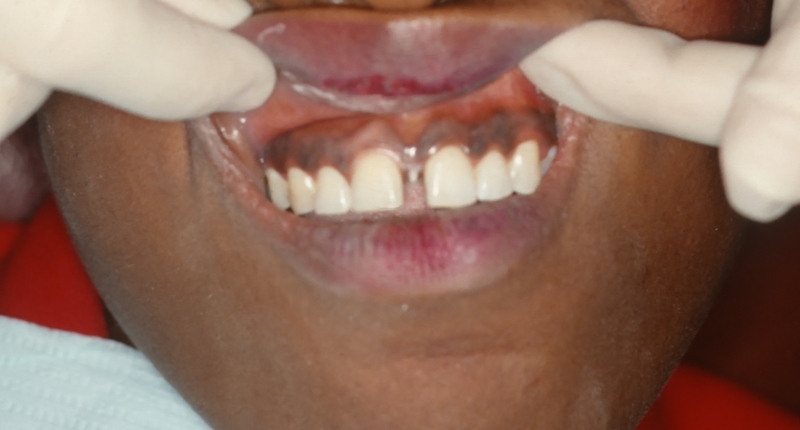 That is why they need to be replaced more often when compared with dental porcelain. 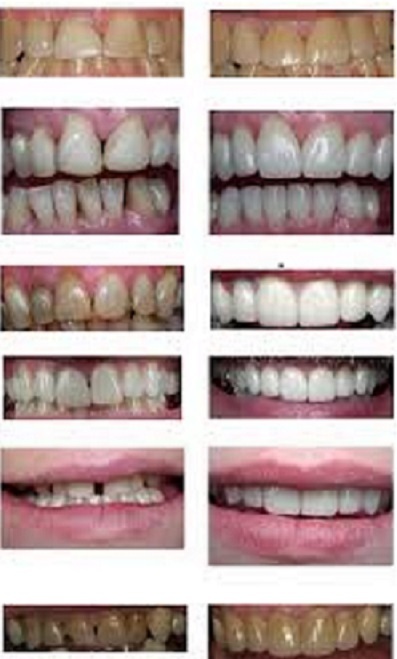 On the other hand, porcelain veneers and crowns are much more durable and they possess better esthetics. Q: Are more expensive veneers better than cheaper ones? A: Not always. 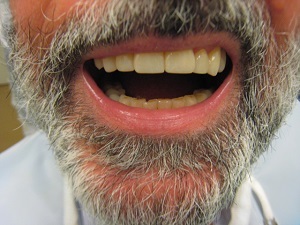 It largely depends upon the expertise, quality of the porcelain used,tooth preparation technique of the dentist as well as the shade selected for matching with the neighboring teeth, regarding the esthetic outcomes of the prosthesis. 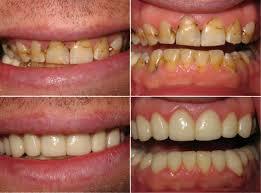 Your dentist is the best person to guide you regarding the choice of veneers.